College Station's 2018 Small Businessperson of the Year Revealed! College Station’s 2018 Small Businessperson of the Year Revealed! 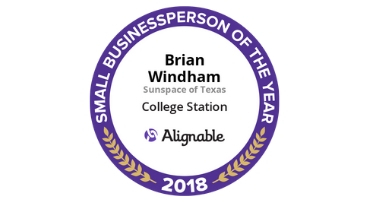 After two months of nominations and voting, we’re delighted to announce that there’s a winner for College Station’s 2018 Small Businessperson of the Year! The winner is Brian Windham of Sunspace of Texas. Competition criteria focused on local SMB role models, who are dedicated to helping other small businesspeople succeed. After an extended round of nominations, top nominees advanced to the finalist stage, where local Alignable members voted for their favorite candidate. College Station’s winner has received a personalized badge to celebrate this achievement. The badge can help drive more prospects, visibility and recognition on our Alignable network for the rest of 2019 and beyond. We encourage each winner to share the badge on other social media, blogs, and external sites, as well. We were thrilled with the massive response we had after announcing this contest, which was held in 1,400+ communities across the U.S. and Canada. Special thanks go out to all participants, including more than 30,000+ nominees and voters. Stay tuned for the 2019 version of this competition early next year.